A Confederate soldier takes part in an attack on a stagecoach toward the end of the American Civil War, only to discover later that his side had already surrendered - and as a result, he is wanted for murder. 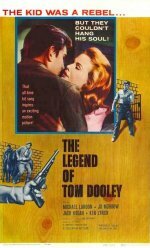 He returns to his home town and marries his fiancee, but has to flee when a lawman comes looking for him. Western, starring Michael Landon and Jo Morrow. Inspired by folk group the Kingston Trio's hit song (which they perform on the soundtrack here) this Civil War western follows the lyrics all the way to their downbeat conclusion and turns out to be an unexpectedly resonant little picture. Michael Landon and Richard Rust are excellent as two of the Confederate soldiers who, not realising that the war is over, rob a Union stage and have to go on the run. Jo Morrow is good as the northern girl with whom Landon attempts to elope. Writer/producer Stan Shpetner deserves credit for an intelligent script, and director Ted Post handles his young cast well.